How to Connect DVD player to TV in 10 easy steps. 1.) Look at the back of your DVD player. It should look something like the picture below. 2.) Locate the three round connectors - a yellow, a red and a white together. The yellow one should read video output, the red and white should read audio output. 3.) Get cables. Your DVD player may have come with three RCA type cables in the box when you got it, a yellow at both ends, a red at both ends and a white at both ends of the cable. If not, you will have to get these three cables. You can find them at Radio Shack or other retail stores. The cables should be long enough to reach to your TV location from the DVD player. Typically 6 feet is long enough. 4.) 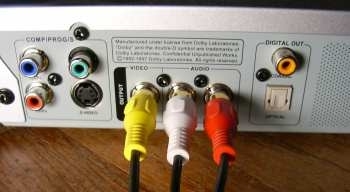 Plug in the three RCA type cables to the DVD player as shown below. Match the colors! Yellow to yellow, red to red and white to white! 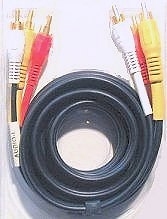 The connectors on the ends are known as RCA connectors, and the yellow cable is known as a composite video cable, the red and white as stereo audio cables. The white is the left stereo and the red is the right stereo channel. 5.) Look at the back of your TV. It should look something like the picture below. You are looking for three round connectors, a yellow, a red and a white. The yellow one should read video in, the red and white should read audio in. If you do not have the three colored connections, you probably have an older TV set, so you need to go here. 6.) Plug in the other ends of the three RCA type cables to the TV set (match the colors and make sure you put them into the video and audio INPUT. 7.) You will probably have to set the TV to the INPUT that is being fed via the video connector, so you'll need to press a button on the TV or the TV remote control - it will probably say something like TV/Video or VIDEO1 or DVD. Once the DVD player is connected to the TV and powered ON, keep trying the button until you see the DVD players output on the TV screen. 8.) Push the OPEN button on the DVD player and insert a DVD-Video in the tray (label side UP). 9.) Push the button to close the tray and then push the PLAY button. 10.) You did it! Now you are done! Sit back and enjoy the show. OLDER TV - OK, so your TV is old and you don't see the round colored connections shown in the photo. What you probably see is just one connector on the back of your TV - like the photo below. This is the RF coax cable connection. A cable TV or antenna 75 ohm coaxial cable connects to this INPUT on your TV and provides video and audio over one cable. A VCR also has these connections. If your TV only has this kind of connection, you need to get a RF modulator box in order to connect your DVD player to your TV. A RF modulator box is a small $20 converter which allows you to plug in your DVD player's 3 RCA cables to the box and plug in your coax cable connected to your TV. You can watch TV as normal or switch over to watch the DVD player's video on channel 3 or 4. The DVD output will be converted to a RF (radio frequency) and be then output to your TV over the coax cable. The picture will not be quite as good as a direct connection but will be OK. See connection diagrams. 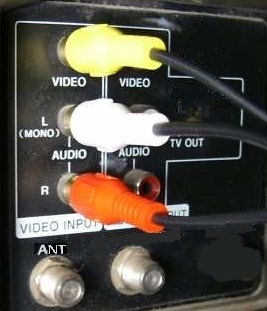 RF Modulator box used for DVD player (and other devices) to TV connection. Some older TV sets do not even have a coax cable connection. 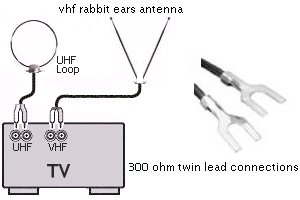 They may just have two screws where a VHF rabbit ears antenna connects and two screws where a UHF loop antenna connects. For these older TV sets, you need to use a video balun (balanced to unbalanced) to convert 75 ohm coax to 300 ohm twin lead and then still use the RF modulator box to connect the DVD player to your TV. A video balun is a transmission line transformer for converting balanced input to unbalanced output or vice versa. An old typical usage of the balun was (and still is) with TV antennas. An example of a video balun to convert 75 ohm coax cable signals to 300 ohm for connection to TV antenna terminals. The coax cable screws into the round end and the twin lead connects to the TV antenna terminals. Connect the coax cable from the RF modulator box OUTPUT to the round end of the balun and then connect the twin leads to your TV antenna terminals. 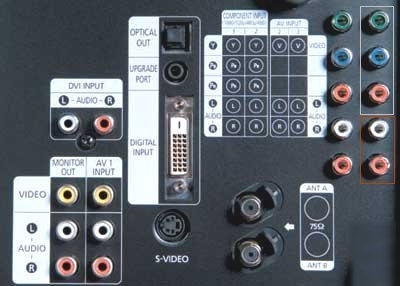 For those of you with newer, more modern TVs you're better off connecting your DVD player to the TV using an S-video cable or component video cables if your TV has these connections. You will probably have to buy an S-video cable as they are not normally supplied with the dvd player. The S-video cable or the component video cables transfer VIDEO only, not AUDIO, so you'll still have to use the stereo cables for the audio. S-Video uses a 4-pin connector and is usually black. S-Video gives you a better picture than composite video. Most DVD players have S-Video connections and most new TV sets also have S-Video. 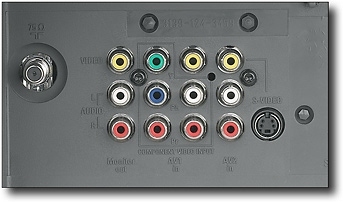 Newer TV with composite video (yellow), S-Video (4-pin black) and component video (green, blue, red). Many DVD players have component video output. Component video gives you even better video than S-Video. 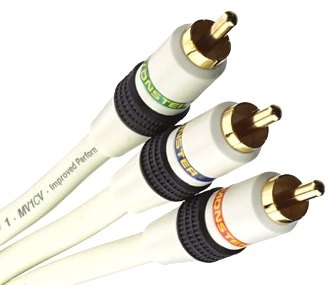 Component video uses the same RCA type connectors that composite video uses, but has 3 (green, blue, red) instead of just 1 (yellow) cable for video. The component video connections on this TV are outlined in gray (upper right corner). The stereo audio connections are outlined in red. This modern TV has yet another video connection, the DVI, which is all digital video. It is a multi-pin and is usually white or silver. Few low cost DVD players will have DVI but it is becoming more popular with the advent of digital TV monitors and High-Definition TV. The HDMI connection (not shown) is the top-of-the-line found only on the newest players and it transfers both digital video and digital audio in one cable.